This guide is for Orange France FTTP using DHCP to connect (this method currently excludes the users of the PRO package). The guide deals with just the internet connection. Setting up of TV or Phone is not covered here. Now for the regional specific part. Some areas of France require that the DHCP and DHCP6 requests are made with a VLAN-PCP of 6. If you are in one of these regions then this can be done via the ‘Option Modifiers’. The vlan-parent is the physical WAN interface - igb0, em0 etc. Select Interfaces ‣ [LAN] and set IPv4 to “Static IPv4” and IPv6 Configuration Type to “Track Interface”. 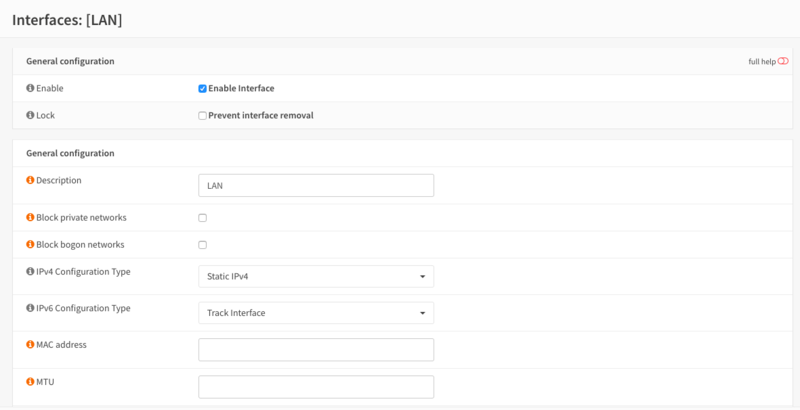 Finally, set the Track IPv6 Interface to WAN and set the IPv4 address to your chosen address.